If you know your group discount code please enter it here. Group codes have been issued based on communication with the Conference Organizers. Groups of 10 or more individuals registering from the same organization receive a discount of $75 per person off their registration. If you do not see the discount appear, this is because your organization has indicated that they would be registering less than 10 people. Any questions regarding your group code should be directed to [email protected]. Workshops are not included in full conference registration, please select by checking the boxes below. All workshops listed above include lunch. The Certified Health and Safety Auditor Renewal course will be offered Monday, April 29 from 8:00 AM - 4:30 PM. Click here to register. The full day Pre-Conference session is sold out. Please see below to add your name to the wait list. One (1) Welcome Reception ticket is included with each Full Conference registration; additional Welcome Reception tickets may be purchased by checking the box below. 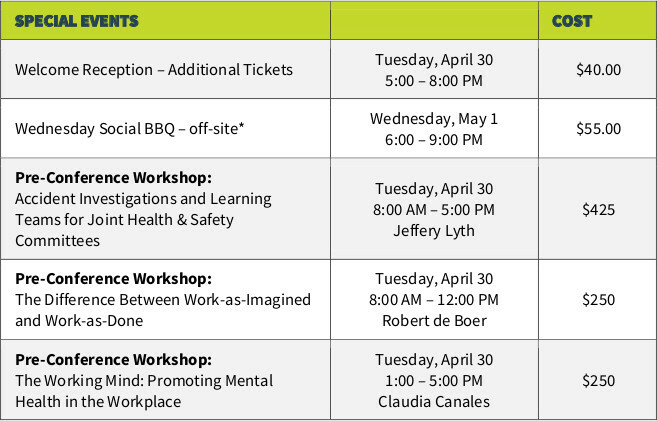 Tickets to the Wednesday Social BBQ are not included with your conference registration; check the box below to purchase BBQ tickets. Please note: Each individual registrant must use a unique email address. There is an option below to include a "cc" address, which can be used multiple times. *In which of the following sectors, if any, are you currently employed? *Please tell us what role or position you currently hold in your organization. Please choose one category that best applies to you. *How many employees does your organization employ? *Have you previously attended the PSC conference? This section will only populate for "Speaker" registrations. *Do you consent to having your presentation be posted online in PDF format? *Will you be bringing a Mac laptop onsite, including your VGA adapter? Yes, I will be bringing a Mac laptop onsite, including my VGA adapter. No, I will not be bringing a Mac laptop onsite. Yes, I require internet access for my presentation. No, I do not require internet access for my presentation. *Does your presentation have embedded sound/video? Yes, my presentation has embedded sound/video. No, my presentation does not have embedded sound/video. If you have not already done so, please upload a brief biography (5-7 sentences) and a high resolution, colour photograph. The biography will be included in the program, on the website, and will be used for introductory purposes. The photo will be included on the conference website. Acceptable formats include .jpeg, .jpg, .gif, .png. *Please confirm your eligibility to receive an honorarium for participating in this event. Yes, I am able to accept an honorarium. No, I am not able to accept an honorarium. *Do you agree to the terms of your speaking arrangement, as outlined in your confirmation letter? A block of rooms have been set aside at the Fairmont Banff Springs and will be managed by the Conference Coordinator for out of town speakers. Speaker travel and accommodations are covered on a case-by-case basis as outlined in your speaker confirmation letter. Please provide us with the dates of your arrival and departure even if you are responsible for your accommodation so that your entire stay will be reserved. If you are covering your own accommodation, we can still make the reservation for you and have the Fairmont reservations team contact you for a credit card. Would you like to book this through the conference's travel agent or will you complete the booking on your own? All correspondence will be sent by email from [email protected]. Please adjust your mailbox filters to allow emails from this address. All PSC 2019 registration and social event fees are 100% non-refundable but may be transferred to another individual. Notice of substitution must be made in writing to PSC Customer Service at [email protected] by 11:59 pm MST on April 26, 2019. All registration fees are subject to 5% GST and must be paid in Canadian Dollars (CAD). Advance registrations will be accepted until 11:59 pm MST on April 26, 2019, after which registrations will only be accepted on-site. Substitutions may be made until 11:59 pm MST on April 26, 2019 by writing to PSC Customer Service at [email protected]. Credit card payment must be made by VISA or MasterCard. Your statement will read "BUKSA Assoc. (780) 436-0983 Edm". Cheques must be made payable to "BUKSA Associates Inc." In the event of an NSF (non-sufficient funds) cheque, the individual or organization will be charged a $21.00 (incl. 5% GST) service fee. Invoices must be paid within 30 days of the date raised. After this period, invoices become "past due". A confirmation notice detailing your registration will be sent to you immediately upon completion of this registration form. If you do not receive this confirmation within 24 hours please contact us at [email protected]. Recording may occur throughout the conference; by agreeing, conference attendees consent to filming, photography and sound recording as delegates, speakers or exhibitors at the conference. By agreeing to these policies you consent to receive updates about the Petroleum Safety Conference and future conferences organized by ESC. All registration rates are subject to availability. By completing this online form and indicating payment with a credit card, you are authorizing BUKSA Associates Inc. to charge your credit card for the event(s) you have selected. Please read the summary page carefully before completing your registration. Your credit card statement will read "BUKSA Assoc. (780) 436-0983 Edm." We will email you an invoice with payment instructions. You may complete the payment with credit card, cheque or wire transfer. If you have any questions, please contact PSC Customer Service at 780-436-0983 x 231 or [email protected].